Service very friendly, and helpful room was nice and comfy just the right size the only problems was the keys kept not working and the toilet overflowed and kept backing up. It was close to six flags. The keys stopped working and the toilet overflows. 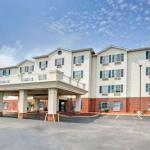 The Super 8 Hotel in Louisville, Kentucky is one of the most frequented motels in the area. Because of its central location, this property is almost always busy all year round. Those who are planning to stay here should not worry though because the people who work in this hotel are highly trained and can handle pressure pretty well. Apart from its great service, the place also offers a delectable breakfast meal each morning and this does not come with a tag price since its free. The hotel also has an airport shuttle that its guests can take advantage of making it easy for you to go to the airport when its time to leave. This hotel has 68 rooms all in all and they all have air conditioning systems, cable television sets, hairdryers, high speed internet access and other basics. These rooms have their own toilets and baths too. Amenities in this hotel include a large parking lot where guests can park for free. The place also offers an airport shuttle service for all its guests a real plus for those who are trying to save some money. The hotel also has a guest laundry facility, free high speed internet access and unlimited local telephone calls. If you are a business traveler, you shouldnt worry because this hotel has its very own business facilities. Parking: Yes, there is parking. Complimentary onsite parking.